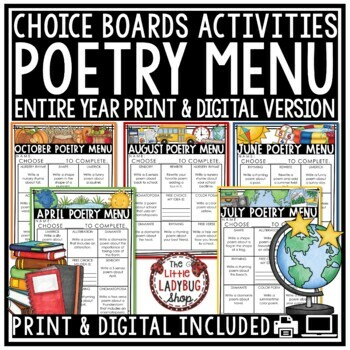 1st Poetry choice board: For use on ANY POETRY different activities to do with poetry study. 3rd Poetry choice board: Focuses on different poetry to create and write. 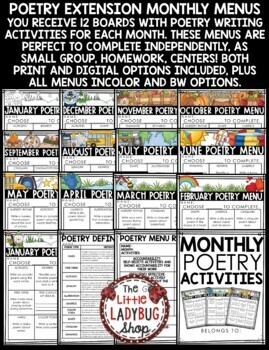 This is a perfect Poetry activity to complete independently in literacy groups, warm-ups, homework, small groups. Thank you for visiting The Little Ladybug Shop. I would love for you to become a follower. The Little Ladybug Shop followers receive new product information and discounts on any new items!